Beast Wars, or as we Canucks knew it, Beasties, was my first real Transformers experience. Being born in the tail end of the 80s I wasn’t fully cognisant of G1 until my later years when I grew to appreciate the original franchise. Beast Wars was everything to me as an impressionable child. I was obsessed with dinosaurs and robots, with both ever present right from the start in the Beast Wars TV show I was hooked immediately. My very first brand new Transformer, gifted to my for my birthday, was the Beast Wars basic class Razorbeast, a pivotal character later on in the comic books who never appeared on screen in the show much to my dismay. Following that was Terrorsaur, a Christmas present from my parents the same year. I was absolutely giddy to finally own a character that I could see on screen as I flew him around the house “Terrorizing” the cats. Both were eventually lost to time but have since been replaced by loving family members. Razorbeast even came MISB on the blister pack so I literally relived my very first Transformer’s birthday gift all these years later on my birthday before last! 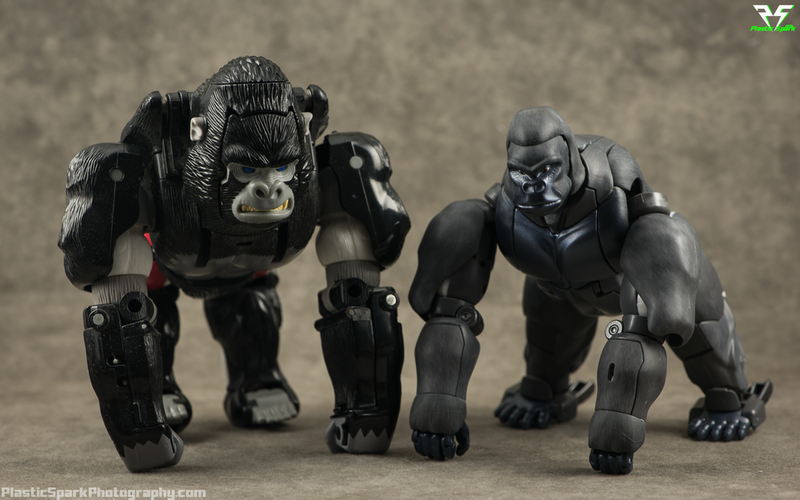 As nice as these smaller bots were, nothing could compare to the day I received the ultra-class Optimus Primal. I still remember tearing open the package and staring in awe at, what I thought at the time, was a perfect representation of the Maximal leader. Packaged in ape mode, the transformation was simple but satisfying. The final robot mode was what defined Transformers for me for years to come and really pushed me headlong into the franchise. I’ve been enjoying the Masterpiece line for many years now, with near perfect representations of G1 greats like Optimus Prime and Grimlock, with a nagging voice in the back of my head wondering if Beast Wars would ever receive a treatment similar. It seemed nearly impossible until in 2013, a fan poll was held to decide the next Masterpiece figure to be made. I was flabbergasted to see Optimus Primal was one of the available choices, and while Star Saber eventually came out victorious, there was Optimus Primal sitting in a cozy 6th place, much higher than anyone could have foreseen. 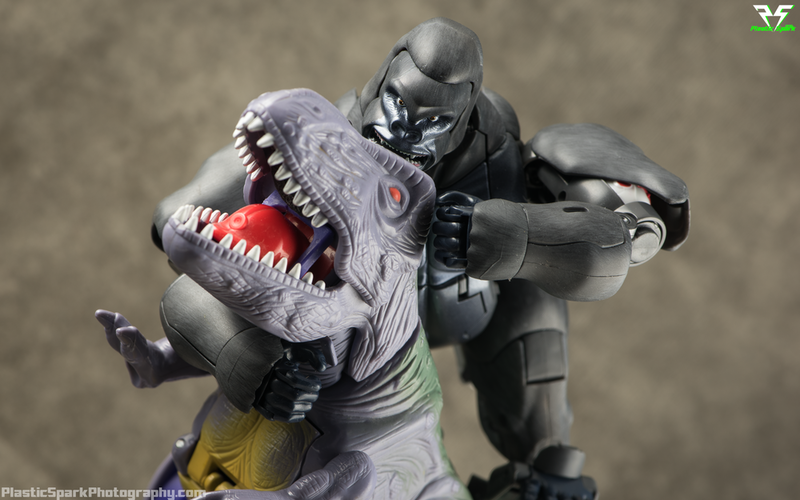 A few years later and news of Masterpiece Optimus Primal becomes reality as prototypes are shown in Japan and an official announcement is made to commemorate the 20th anniversary of Beast Wars. Now in 2016 he has finally made his way to me. To steal a phrase from the mighty Megatron; “I would have waited an eternity for this!” and now that he’s here let’s take a look! I'm not going to say it. Nope. Beast mode was always going to be the hard part. 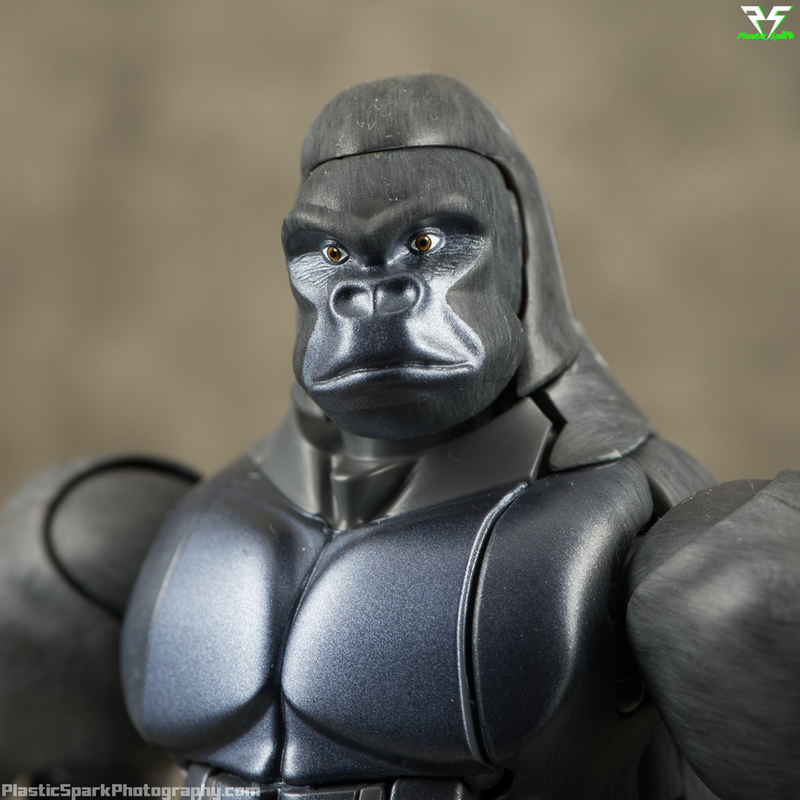 Optimus Primal’s robot silhouette has been pretty much mastered since the original toy release but making a realistic gorilla that matches the CG models from the show was not going to be easy. There are going to be some sacrifices made, so let’s look at this figure objectively. Now there's a face that only a monkey could love. Does it look like a Gorilla? Yes. It doesn’t look like a perfect real world gorilla with fur and leathery skin but it looks like a convincing ape. Does he look like the source material? Absolutely! Almost to a fault. This is the trade-off that is going to divide some fans. 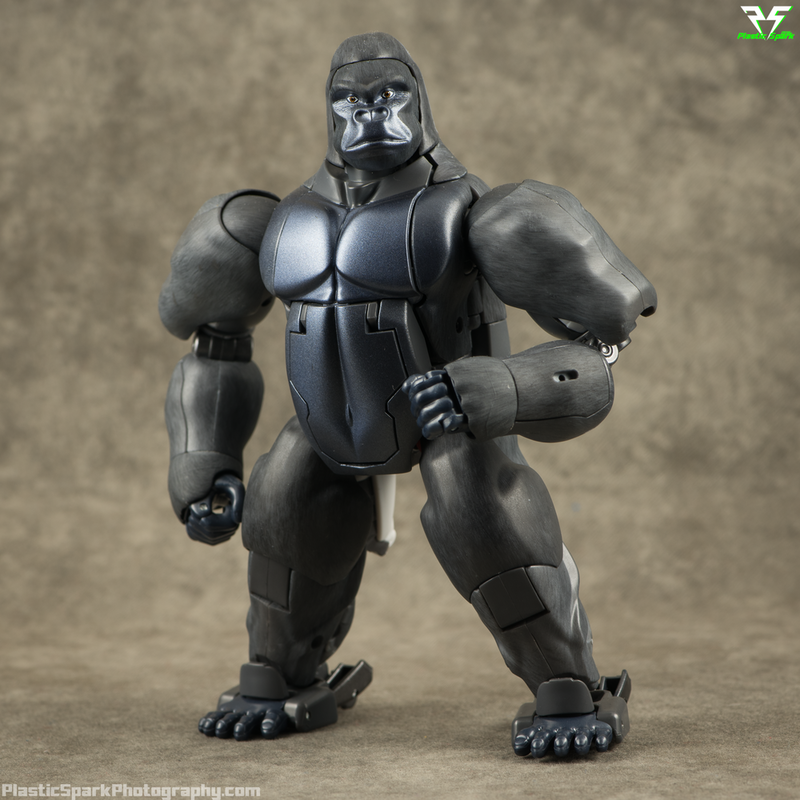 While I personally would have loved a more realistic gorilla mode I applaud Takara for their attempts in replicating the on screen ape model. The use of digital transfers for the fur texture is ingenious if slightly flawed. There are a few spots on my copy where the transfer has flaws and hard seam lines but this is likely hit and miss with each copy. The almost metallic paint on his chest and belly do a convincing job of separating skin from “fur” and looks very nice in hand. The gorilla faces are nicely painted with crisp details. Painted eyeballs are new to the masterpiece line and could use some work but most of mine are satisfactory. I have seen a few cases of crossed or lazy eyes on some copies so if you have the option of inspecting your copy before purchase take the opportunity and have a good look. Pound your chest all you want, I'm not going to say it! One benefit to a Transformers figure converting from an ape into a bipedal humanoid robot is that much of the articulation is carried over in both modes. 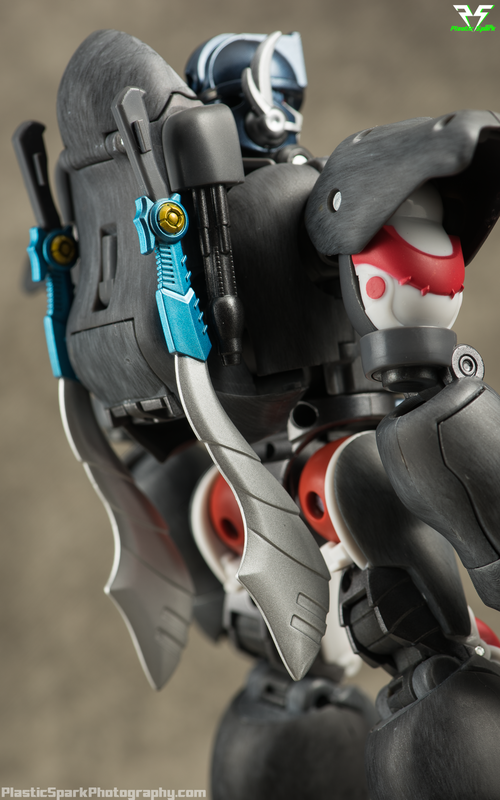 The entirety of Primal’s upper body is nearly identical in articulation, with full movement of the arms and a large ball joint at the base of his head allowing him to look side to side, as well as straight forward when he is on all fours. The legs suffer quite a bit due to transformation but they are usable for basic postures, much more so when he is standing upright rather than leaning forward on his knuckles. 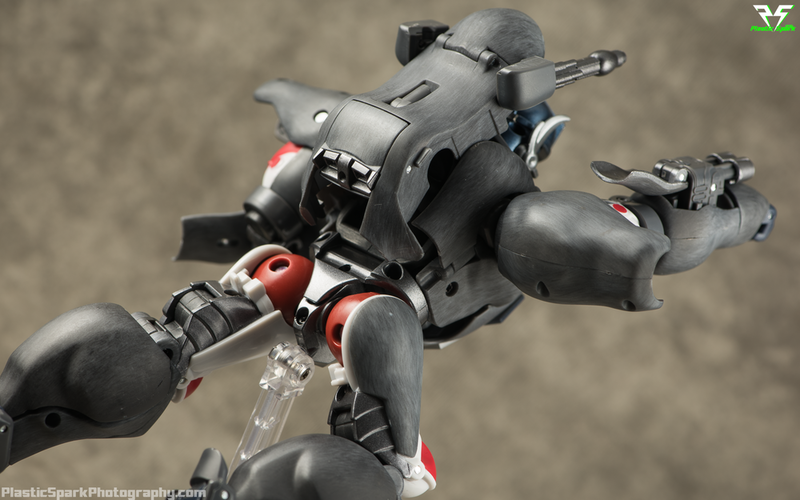 There is a specialized joint in the waist, similar to an ab crunch but only accessible in this mode, specifically to increase the range of his legs in beast mode and it’s a bit tricky to un-clip the first time but works wonders for more realistic poses. As previously mentioned the beast mode head is on a huge ball joint with a great range of motion and switching out the face plates is as simple as pulling one out and snapping in a new one, no screws, no buttons or clips, just friction. It works well and doesn’t seem to cause any stress or damage. This was a nice addition to the figure since there was a lot of time in the TV show spent in beast mode, and the ability to have various expressions in this mode is greatly appreciated. The aggressive expression and neutral, thoughtful expression look great, with the smiling face being a bit of an amusement, sure to cause plenty of silly internet memes I’m sure. If the name of the game is screen accuracy, MP 32 has it in spades! 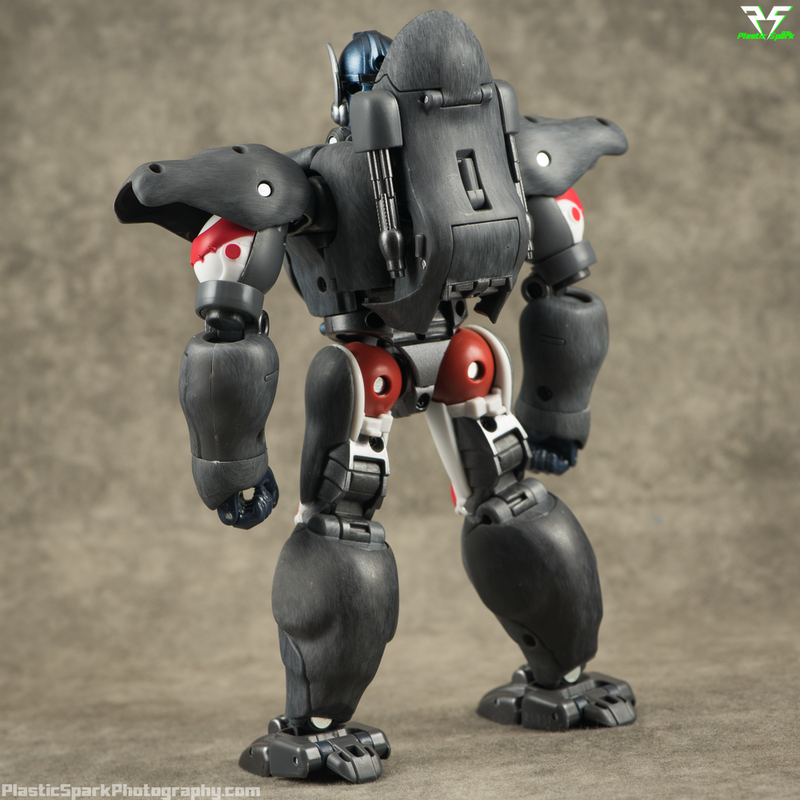 This is one gorgeous looking robot with a ton of 3D model inspired detail. His transformation is very similar to the original figure from 20 years ago, with just the right amount of Masterpiece nuance to make things interesting. He has a few thinner panels that made me a bit nervous on my first transformation but once you get to know the figure you’ll see that it is incredibly well built and I don’t feel nervous at all transforming him now. He is solid and tons of fun to transform and pose. Well that's just -- NO! I won't do it! Articulation on MP 32 is very similar to the original Ultra Class toy, with a ball jointed head, universal shoulders with ratchets, deep elbows that easily exceed 90 degrees, a full 360 degree waist swivel, ball joints at the hip and knees that bend ever so close to a full 90. Masterpiece level engineering however has added in wrist joints, articulated hands (open or closed) with a separate joint for the index finger, and ankle tilt! I would have liked if the index finger had a second knuckle to allow him to point forward but considering the size of the figure I can understand why this was not implemented. 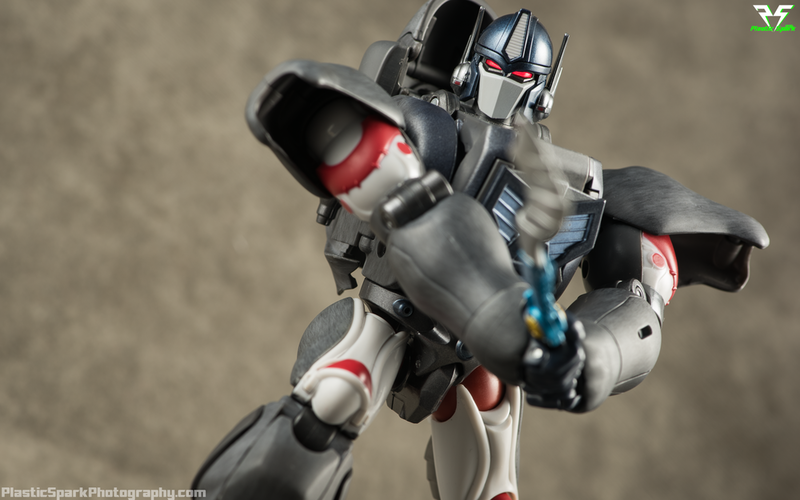 Masterpiece Optimus Primal is an incredibly fun toy to play with, and a lot of that enjoyment comes from the various gimmicks that Takara managed to include. Both arms have pop up dual plasma cannons similar to the ones Primal used in his on screen battles with Megatron and his terrifying Predacons. The cannons sit flush and seamless in his forearm when not in use, and a small tab on the underside of his arm can be pushed to begin the process of activating these cannons. Simply pull the cannon straight outward and extend the barrels to begin blasting the Preds to pieces! Due to the implementation of this gimmick on both arms, to be show accurate, there is no skull mace embedded in the right arm. This weapon was included as a die-cast pre-order bonus for those who purchased their MP 32 from Hasbro Asia or from certain online retailers. MP 32 carries over one of the coolest gimmicks from the original toy, shoulder mounted cannons/rocket launchers! While they forego the spring loaded gimmick (for the better) they are easily rotated into place and look awesome deployed. The original toy had much larger shoulder cannons and while they certainly look more intimidating, much like the new wrist mounted weaponry, these smaller cannons are far more accurate to the on screen depiction of the heroic Maximal leader. 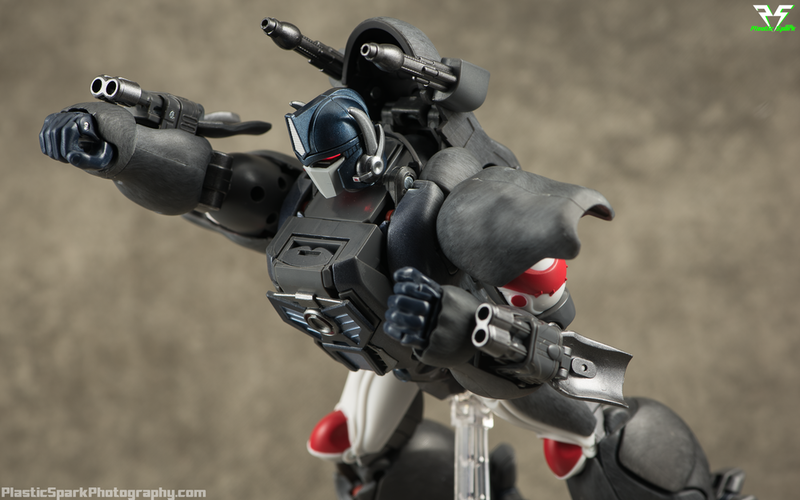 You can also flip out his trademark “Prime Jets” from his lower back to depict Optimus Primal in flight mode. Flying Monkey! Go Monkey Go! 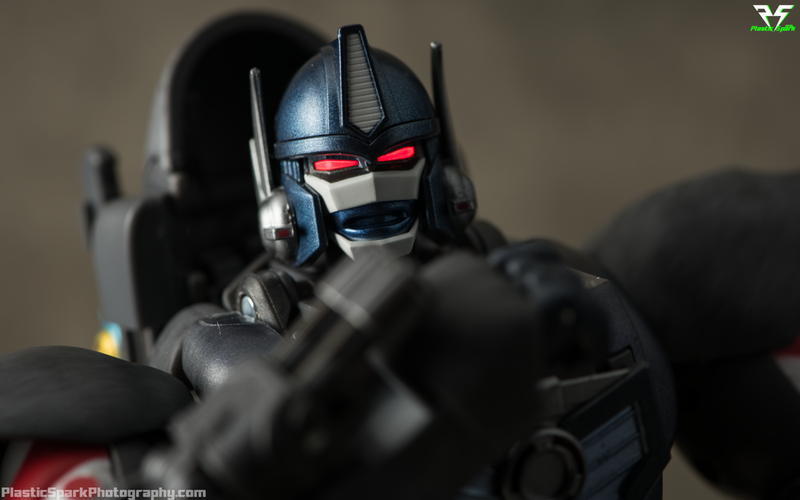 Optimus Primal’s final gimmicks are swappable face plates for robot mode as well as an LED feature installed in the robot mode head. Out of the box he is equipped with what I would consider a neutral facial expression, eyes open and a slight down-turned lip. The other face plates included are an angry face, with optics narrowed and an open mouth growl, a quizzical look with one eye narrowed and a smirk, and lastly a fully deployed battle mask with angry optics. I really love all these face plate options as they each represent significant moods that Primal exhibited throughout the show. He was a calm and rational leader, who wasn’t afraid to think outside the box and do what was necessary to get the job done. Much more down to earth (so to speak) than his G1 predecessor. I think he's mad that I won't say it... too bad. The LED gimmick is effective and easily activated by pressing down on his robot mode head. The light will blaze brightly for around 10 seconds after which it will fade out and then turn off. The batteries are stored in the giant ball joint used for gorilla mode and easily installed with a simple screwdriver. There is a little bit of light bleed when the LEDs are powered on that reflects off of the top of his chest. This isn’t a big deal but it can cause some strange effects when photographing him. 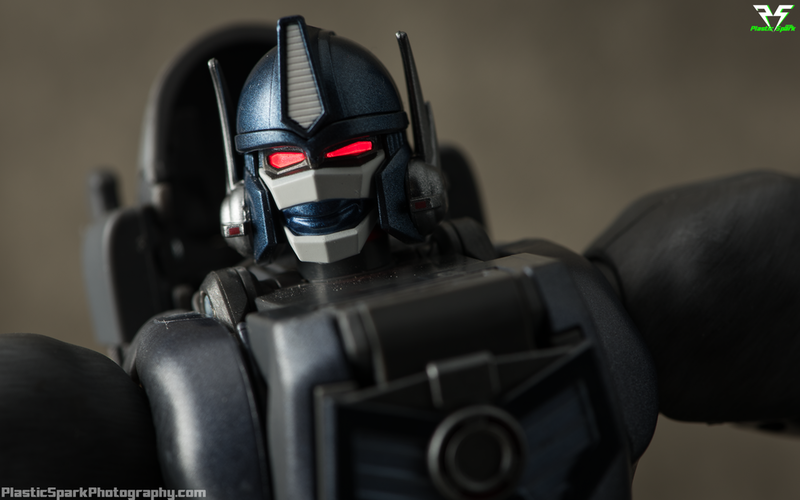 One incredibly minute, but exceedingly awesome thing I would like to note is that Takara took the extra step to paint the eyes on the face plates despite the LED function. This is something they also did on their version of Fortress Maximus and it really goes a long way in resolving one of the worst issues to plague LED featured toys; Dead Eye Syndrome™. The only one that doesn’t have paint is the default face plate, which is actually a nice omission as you can use this face plate for an “offline” mode if need be. Compared to some recent releases MP 32 is pretty light on the accessories, not including his interchangeable face plates. That being said what little is here is incredible well done. If only Harambe had been packing like this. 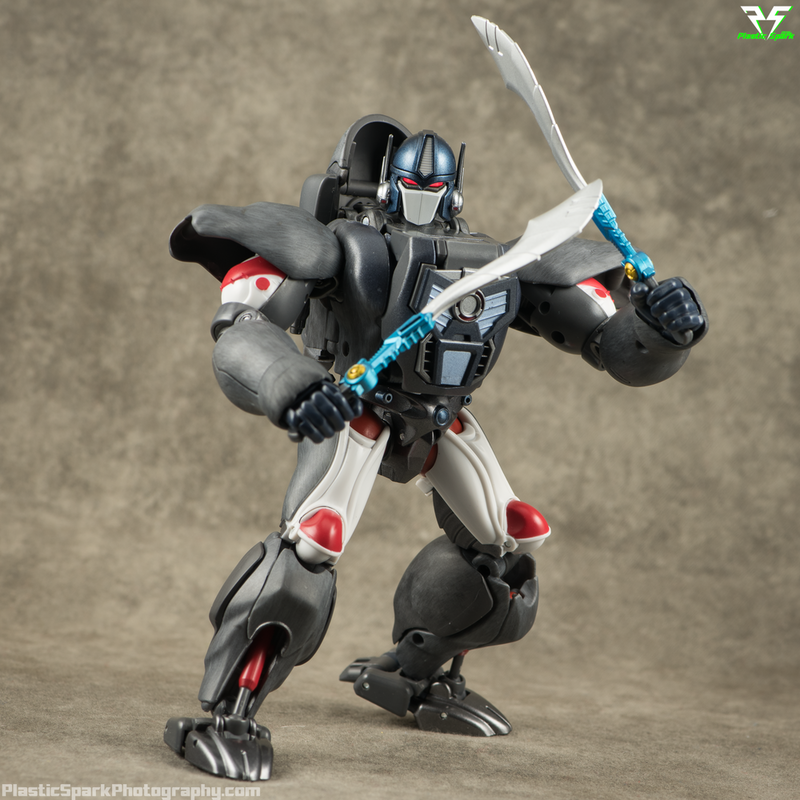 2 x Spinal Swords – Optimus Primal’s signature curved weapons. They can be held in his hands using the familiar tab and groove that we’ve come to expect from Masterpiece Transformers. They can also be mounted on his back. The swords will have to be removed to deploy or conceal the shoulder cannons but can be equipped regardless of the cannons position. They are moulded in grey with an absolutely stunning metallic blue, gold and silver paint job. OK! OK! I'll say it! Put the swords away! 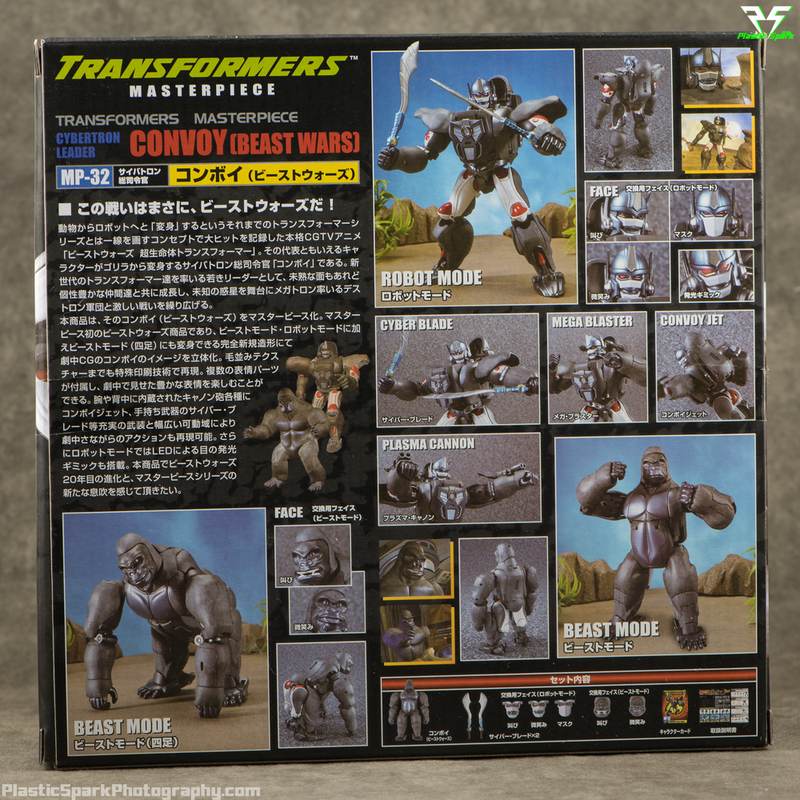 Takara Tomy MP 32 Convoy / Optimus Primal is an absolute dream come true for a Beast Wars junkie like myself. Every bit of this figure has been designed and built with love for the source material and with the intent of trying to improve on an already fairly competent 20 year old toy. Honestly the only way this figure could be better is if they also installed a sound chip with some of Gary Chalk’s incredibly delivered Optimus Primal quotes. If I could press a button and hear “Well that’s just prime.” I might just pass out from over excitement. After living in a world where I truly believed Masterpiece Beast Wars was a fantasy I am so happy to have been proven wrong. Well that's just Prime! Happy now? If there’s one thing that is going to cause people hesitance it would be the cost and the size of the figure. Takara designed MP 32 to be in scale with the current Generations offerings of Rattrap, Rhinox and Waspinator, meaning that overall he actually stands about an inch shorter than the original ultra-class toy, around the size of a tall voyager, about an inch taller than your average MP car. This is an acceptable size to me but for those used to larger leader style characters like MP 10 Convoy and MP 22 Ultra Magnus the size of MP 32 can be a bit underwhelming. I’m happy that I can pose him with my current Beast Wars figures but the asking price is fairly steep considering his size. I imagine some of the price is also due to the fact that he is not easily remoulded or repainted into any other existing characters. I am curious if a Nemesis repaint could be a possibility. 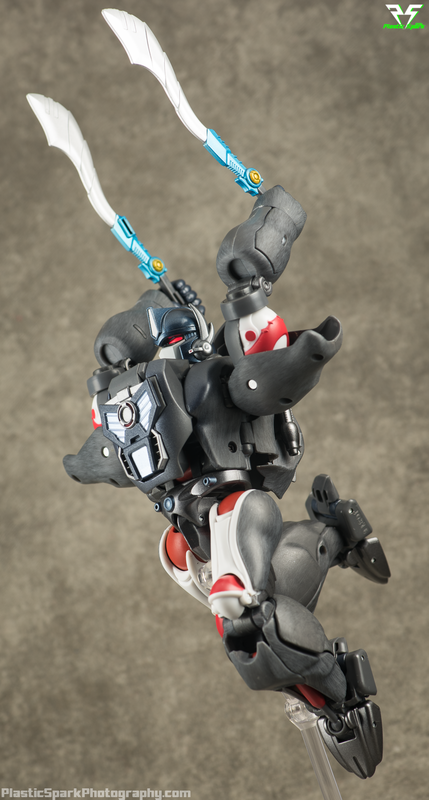 Personally I would love a redeco homaging the Japanese Toys R Us exclusive “Special Convoy Skeleton Type” a clear and black version of the original Optimus Primal. I am incredibly impressed with MP 32 Convoy / Optimus Primal and he is going to be a centerpiece in my collection for a long time to come. 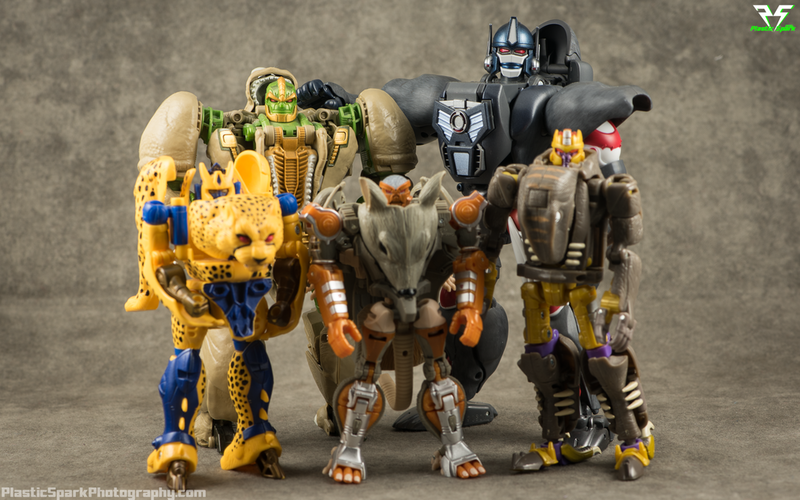 I can’t wait for the upcoming MP Cheetor and any other Beast Wars characters that receive the MP treatment. 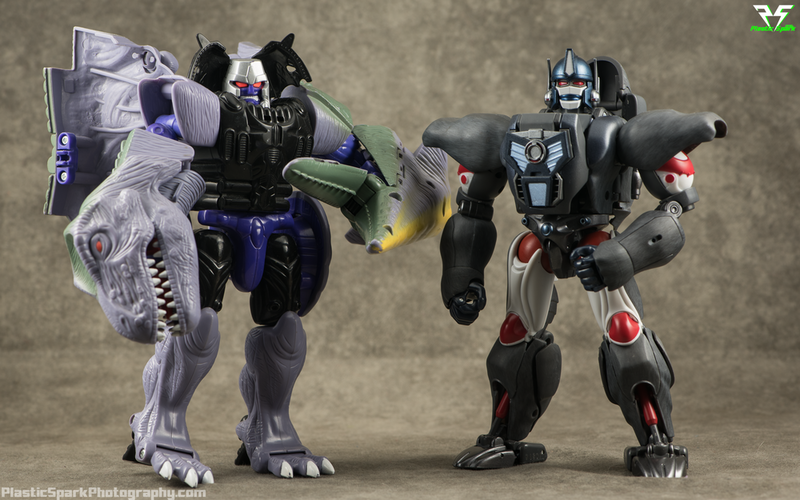 Personally I want to see Dinobot and Terrorsaur in MP form, as well as Beast Wars Megatron. Is there a specific character you would like to see translated into the Masterpiece line from Beast Wars? What about from another series other than G1? Sound off in the comments and let me know what you think! n a side note, I'm trying to hit 1000 likes on the Facebook page before the end of the year and I am well on my way with less than 10 to go! If you liked this review and haven't already signed up I'd be so happy if you did! Follow the blue link below or use the ribbon on the right side of the page to click that like button!